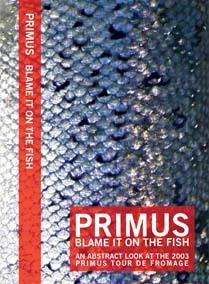 An abstract look at the 2003 Primus Tour de Fromage, "Blame It On the Fish" presents a surreal view of the band's triumphant return, including live performance footage, interview segments, candid behind the scences shots and intese visual imagery. Years in the making, this DVD is not a typical concert film. "Blame It On the Fish" is a sensory adventure pushing the lmits of visual artistry. The main feature film is 70 minutes and is accompanied by over 90 minutes of bonus material. In addition to dozens of additional scenes, the extras also include a 30 minute futuristic documentary about the band set in the year 2065 and interviews with the 102 year old Les Claypool.